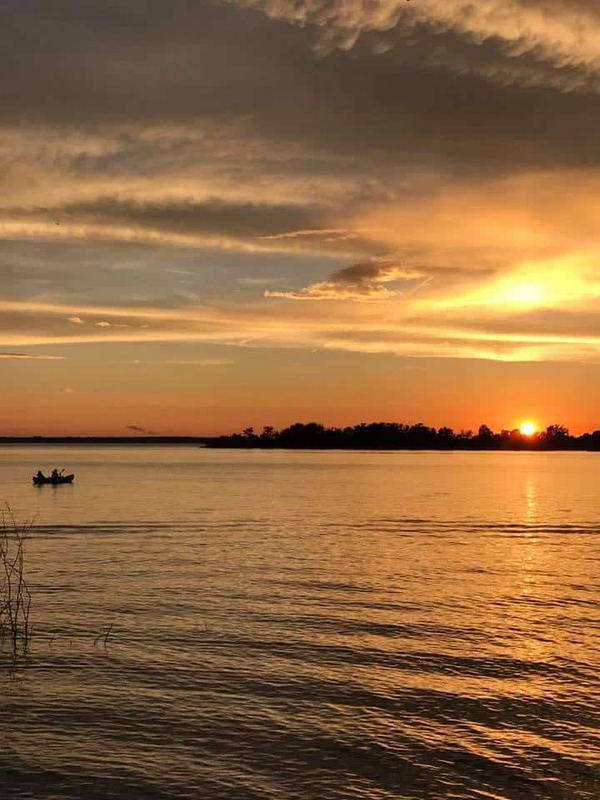 There’s something special about paddling out to the middle of a calm lake, creating a few waves while you’re out there and sitting back to enjoy a beautiful sunset. 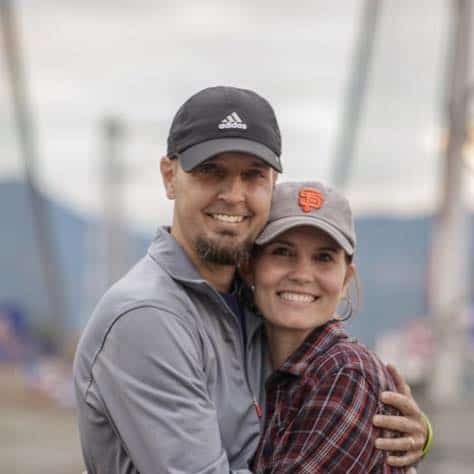 This was one of our first experiences on our RV trip across America and Canada. And you know what’s amazing? That first kayak trip experience is eerily similar to why we decided to sell our house and travel full time. Our life in the suburbs was nice and calm. We woke up every day and did the same things we did the day before. There’s nothing wrong with that, but we were ready to create some waves and wake up that calm lake so to speak. And we were definitely ready to enjoy a lot more sunsets. 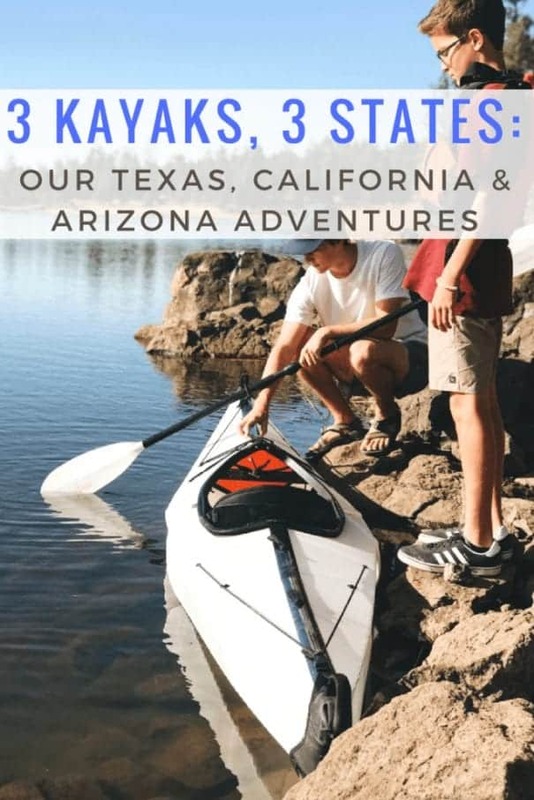 Kayaking has become one of our favorite activities on this trip and we’ve had the privilege of trying out three different types of kayaks, in three different states. Here’s a taste of our summer and fall kayaking adventures. Although we sold and donated most of our possessions, it almost felt like we were buying just as much for our trip. We were RV newbies (and I guess still are only 8 months in), which meant we wanted to be overprepared. So we bought stuff. A lot of stuff. I’m sure Amazon and our delivery guy thought we had some serious shopping problems. One item the boys requested for our trip was a kayak. So we started with the most affordable and what we thought made the most sense room wise: an inflatable kayak for two. 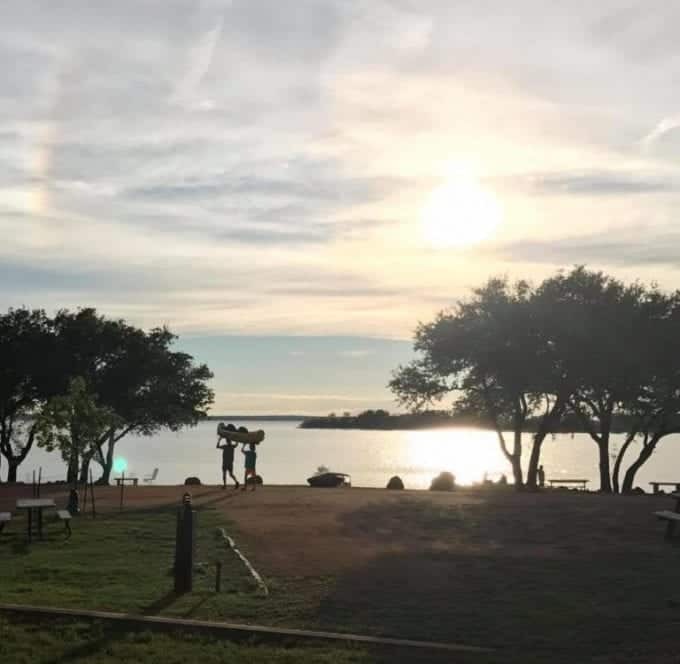 One of our first camping destinations was Big Chief RV park on Lake Buchanan. Having a lake in your backyard was an excellent choice for an introduction to the RV life. We all took turns pairing up and exploring the lake. Kayaking quickly became something we looked forward to. One evening, the boys wanted to out paddle at sunset. I’m not sure how long they sat out in the middle of the lake silently soaking it in, but I do know that moment had a lasting impression on them. 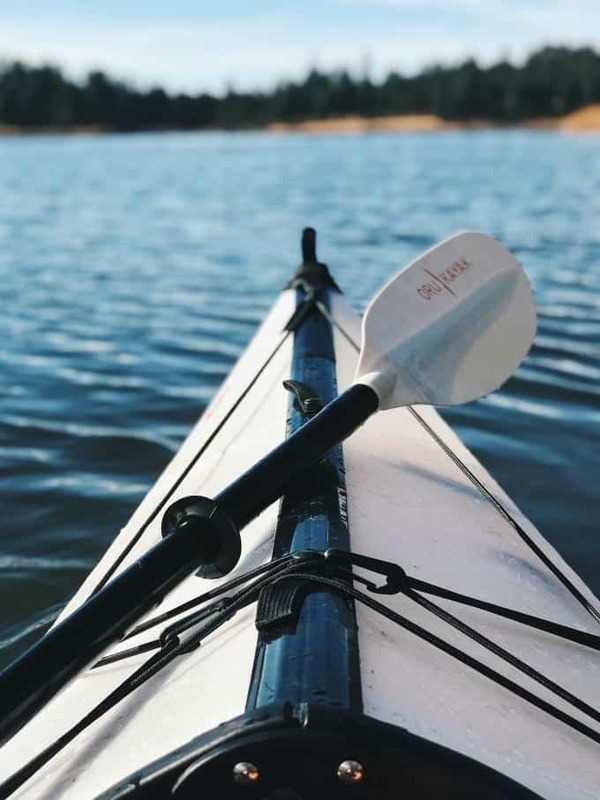 So if you’re looking for a kayak to purchase as an introduction to the sport and to see if you even like it, an inflatable one might be your best bet. It’s affordable. It stores in a bag and the paddles come apart as well. It was also more stable on water than we were expecting. Meaning, no one fell in. Bonus. Thanks to the good folks at Everyday California and Visit San Diego, we had the chance to experience a kayaking tour of the sea caves in La Jolla, California. Let me tell you…this was one incredible adventure. One incredible adventure where I didn’t take a single picture. Yeah, I know. But in my defense, you get wet on these kayaking tours and so do your belongings. So we rented a locker and left our phones in it. It wasn’t until we were almost there that someone mentioned the fact that we should have brought the GoPro with the waterproof case. So instead of our photos, I’ve sprinkled some in from the Everyday California Instagram. If you’re in the San Diego area and want to experience kayaking, book a tour asap. Kids as young six can go on the sea caves tour, so it makes it a fun family activity. There were a few families and couples in our group and everyone seemed to really enjoy themselves. Everyday California uses the tandem sit on kayaks because they’re easy to maneuver, safer and fun. 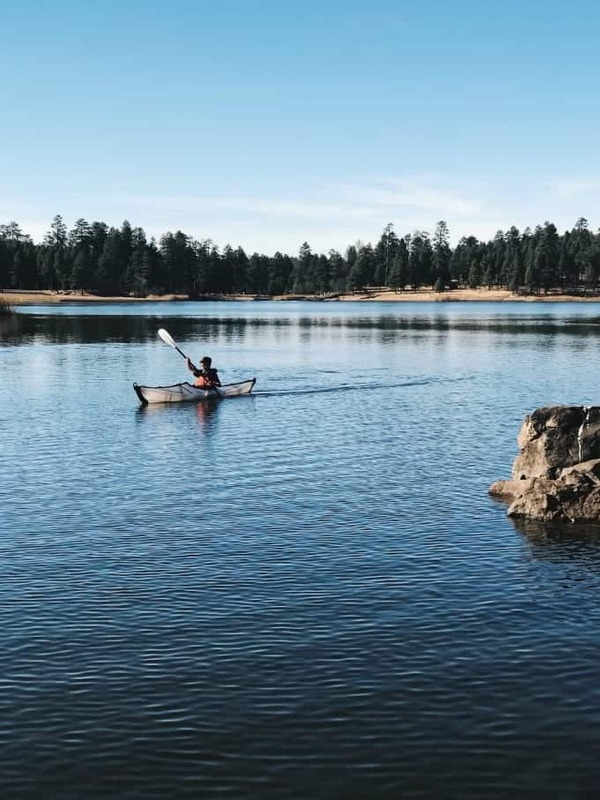 Even if you have limited (aka zero) kayaking experience, you’ll get the hang of it fast. To give you a quick rundown of what to expect, be sure to show up thirty minutes before your tour begins to check-in. We rented a locker for our phones and wallets, but you can also leave them in your car if you parked relatively close. 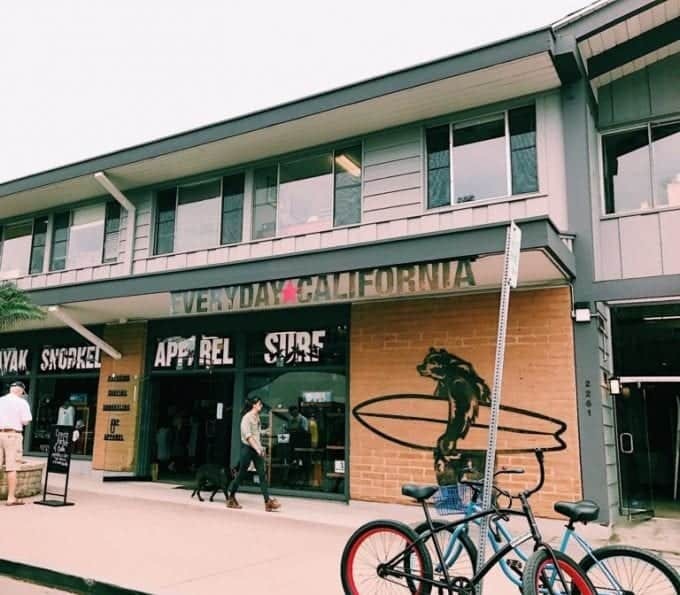 We were there in November and the weather was pretty cool, so we opted to rent their wetsuits. Some of us rented the entire wetsuit and some of us only the top. After we got out on the water, I was very happy with that wetsuit. They said you would get wet and you do! After a short, but educational, introduction to using their kayaks and the tour in general, we were off. The tour included our very funny guides entertaining us with stories and facts about the area, as well as educating us on the four microhabitats present in the La Jolla Ecological Reserve. We saw sea lions sunbathing on the rocks, including a baby sea lion waiting for his mother to come back to shore. I just sat there in my kayak mesmerized by these animals. Entry into the sea caves is dependant on the weather and thankfully it was a great weather day. They took us in one kayak at a time. The water was so incredibly clear that you could see everything that was in the water, like brightly colored fish and plants. There were a couple of people snorkeling in the sea cave while we were there. I can only imagine the amazing things they saw in that water. After everyone had a turn in the sea caves, it was time to start paddling back. They gave us a quick how-to on riding a wave back to shore. It was surprisingly easy! If you’re looking for a fun water activity experience that both you and your kids will remember forever, I highly recommend booking a tour with Everyday California. You can see all of the tours they offer here. When people ask about our trip and what we’ve learned so far, one thing we always say is that we traveled too fast. Wyoming, Montana, and Canada are almost a blur to me because we were on the move from one RV park to another, trying to get to the next destination quickly. If you’re thinking of hitting the road full-time, don’t do what we did. Soak in each place, each town, each moment. We’re talking about heading back to the west after we’re done with the east to revisit some of the places we rushed through. I hope we can make that happen. When it was time to book our stay in Arizona, we knew we wanted to be close to Sedona and we knew we wanted to stay for a bit. So we booked two weeks at a campground in Cottonwood. Two weeks felt like an eternity (especially since there was zero cell service at our spot), but we left rejuvenated. We also fell in love with Sedona, which I’ll tell you more about in another post. The hikes there are unlike anything I’ve ever seen. 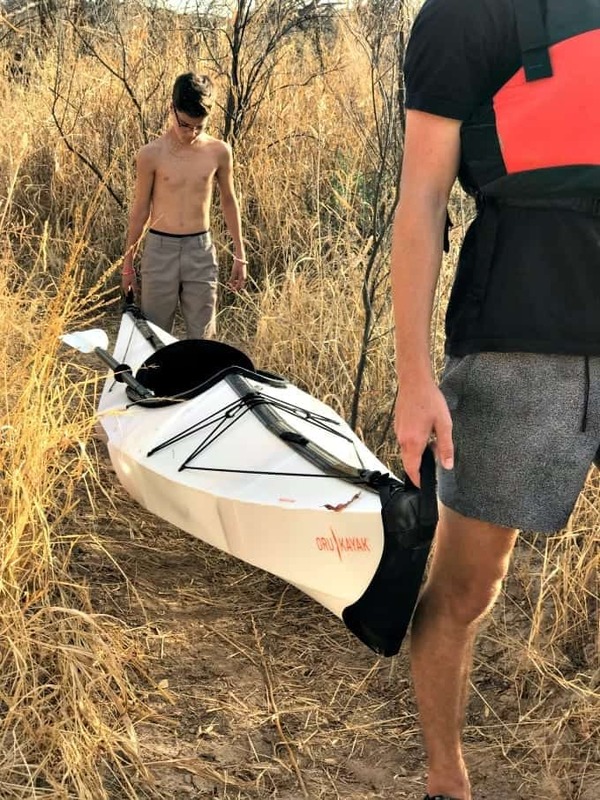 While we were there, we had the chance to test out something my boys have been talking about for ages – a folding kayak. An Oru Kayak to be exact, which is the original folding kayak. We tested out the Bay model. When we opened the box, I just stood there staring at the bag and said ‘there’s a kayak in there? !’ I could not believe it was possible to fit something that size into a bag. 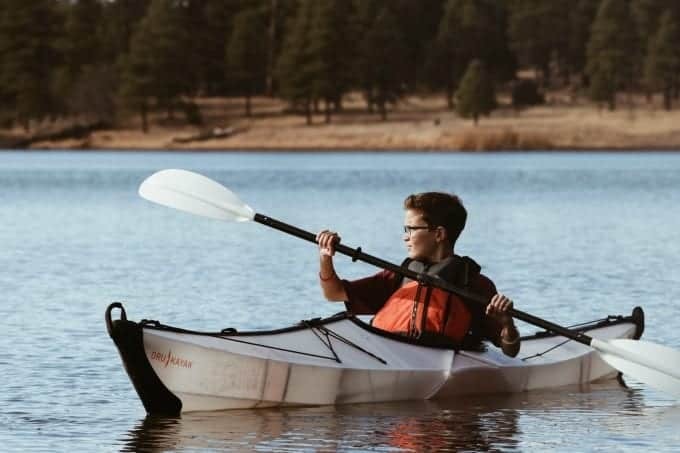 I read tons of articles on this kayak and a lot of people compare the folding up process to origami and they’re exactly right. 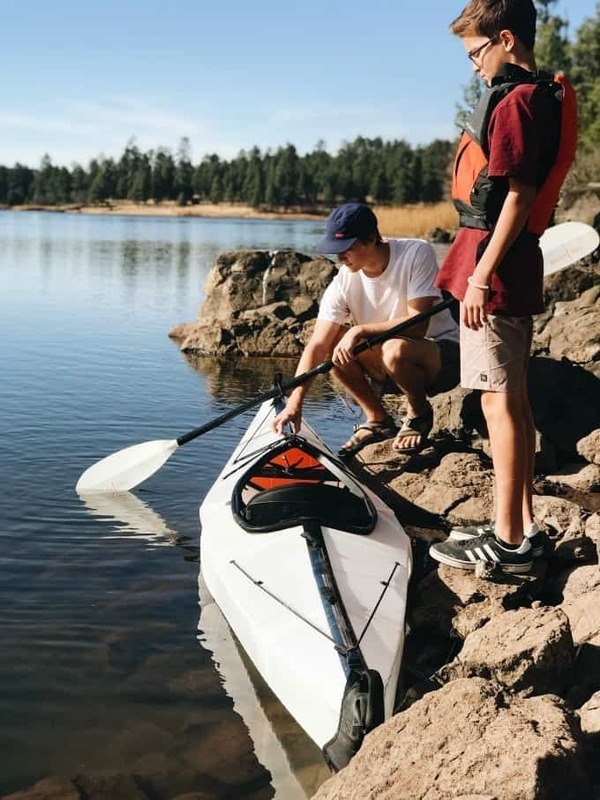 The Bay Oru Kayak folds up into a self-containing 33″ x 12″ x 29″ box. 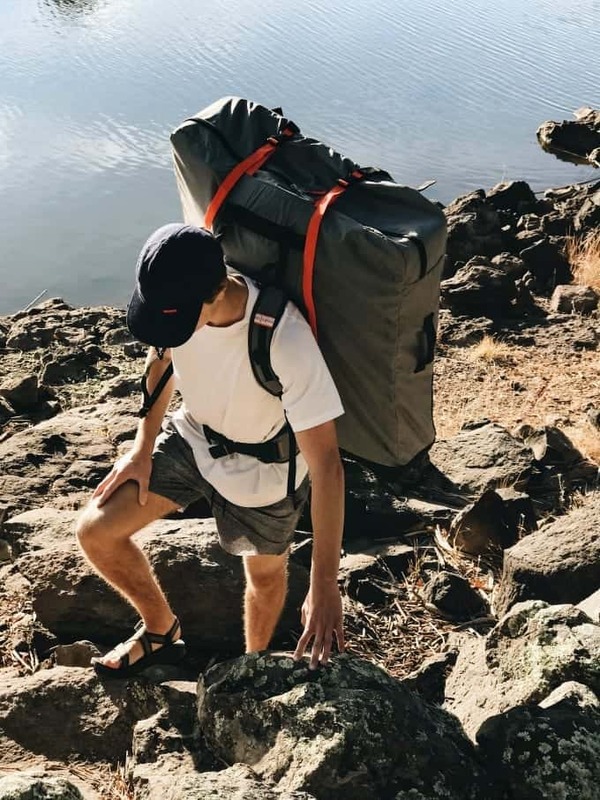 It weighs only 28 pounds, which makes carrying it on your back (you have to purchase the pack separately) to your kayaking destination quite simple. The first time the boys put the kayak together, there was a bit of a learning curve. But after that first time, they could put it together and take it apart in about 5 minutes. That’s faster than airing up our inflatable kayak. Pretty remarkable. Todd and the boys found a lake close by our campground to take the kayak for a test run. 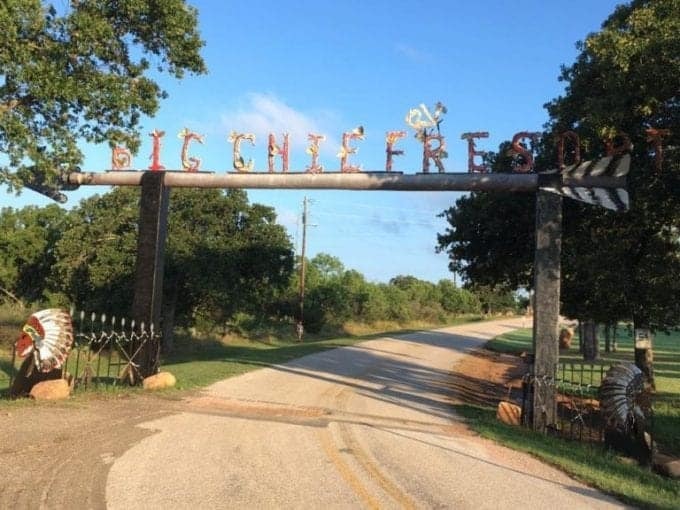 They were beaming when they arrived back at the campground. Then they went on to explain how the kayak glides through the water and how it took them no time to get the hang of it. 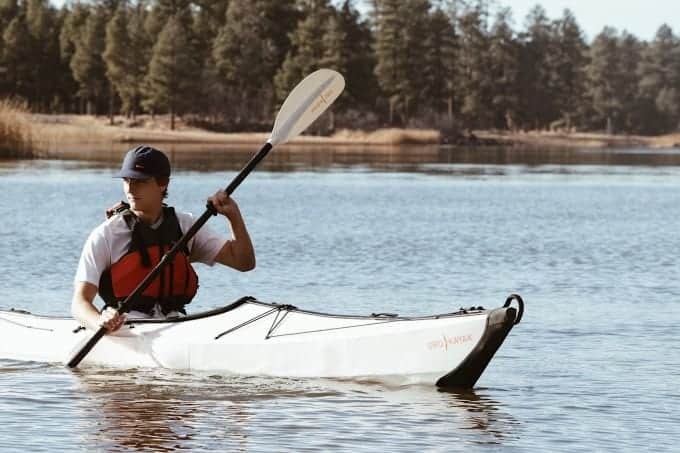 This kayak is easy for beginners to learn on, but is also fast and sporty enough for experts. Durability – Made of custom polypropylene with a 10 year UV treatment and has been rated 20,000 folds! 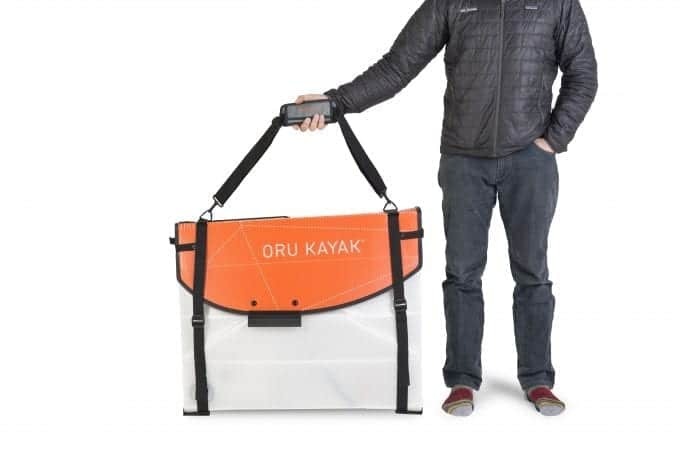 The Oru Kayak is the perfect addition to your summer camping trips. It also makes a great gift for everyone from kids to grandparents. Oru offers an affordable payment plan through Affirm. You’ll know exactly what your total and monthly payments will be up front. Are you ready for some kayaking adventures? We’re heading east for the spring and summer and can’t wait to find some of the best kayaking spots that part of America has to offer. A special thank you to Oru for lending us a model to test.